Pallet Trucks – Why Are They So Good? 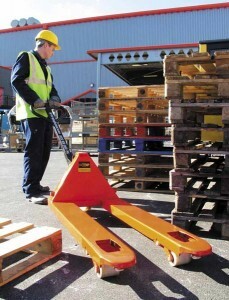 Pallet trucks, whether hand operated or electrically powered, are the ideal cost effective handling equipment solution. These items are specifically designed to make the lifting of heavy objects easier for an individual as these items are easily and effectively able to lift and move palletised loads of up to 5 tonnes or 5000KG. The operation of hand pallet trucks is usually provided by a steering lever, which is equipped with a release handle. Pumping the lever causes the trucks forks to rise, whilst simultaneously lifting the trucks load. Pulling the trucks release handle causes the load to slowly lower to the required level. Pallet trucks are specifically designed to be driven under a pallet, once a pallet has been lifted it can be easily manoeuvred to its required location. This can be achieved by hand as an operator is then able to push or pull the truck. Due to their operating ability, pallet trucks are perfectly suited for use in the warehouse environment, where they can be used to manoeuvre pallets. Similarly, pallet trucks can be used to good effect to unload loads from trucks which make use of tail lifts. Electric motorised pallet trucks on the other hand, can easily be operated using the electrical assisted travel and manoeuvring ability. Similar to the manual model, electric motorised pallet trucks are operated from a handle. Electric motorised pallet trucks are frequently used in order to transport heavier loads, or when projects are so mentally intensive that it is important to make things easier for workers and employees, in order to dramatically improve the levels of productivity within the warehouse environment or loading bay. Electric motorised pallet trucks are powered by a battery pack. These battery packs often have an incredibly long lifetime. It is a common practice with electric motorised pallet trucks make use of them during the day and then charge the battery pack overnight ready for use the following day. If pallet trucks are left outside for extended periods of time they can begin to rust and corrode. In order to avoid this occurring there are a number of corrosion resistant galvanised pallet trucks. Alternatively, for companies who operate in the food industry and related services, there are a large number of stainless steel pallet trucks available. This is because food is often transported in bulk orders which can become too heavy for an individual to manually lift. For more information about the pallet trucks available from Handling Equipment Online, please contact us on 01384 895859 or email us on sales@handlingequipmentonline.com. This entry was posted in Handling Equipment and tagged pallet trucks on December 3, 2013 by admin. Since the introduction of pallet trucks, factories and warehouses have become much easier places to work. Within these workplaces pallet trucks have become a common sight, and are widely used, this is due to their unparalleled ability to aid both productivity and mobility. The pallet truck drastically reduces the amount of time required to move heavy or cumbersome objects, and in the current economic client, time is an ever precious resource. Therefore a pallet truck can grant you a significant advantage over your competitors. Within distribution companies, the majority of the work involves transferring an object from one destination to another. With the introduction of a pallet truck the amount and weight of transport potential can be greatly increased. It is worth considering the increase in both income and available time for other jobs, as your workforce is able to move heavier loads quicker; all with the aid of a pallet truck. Regardless of the size of your distribution company, selecting the type of pallet truck to suit your needs can sometimes be a taxing exercise. There is a vast range of pallet trucks available to suit a great array of functions; it is just a matter of taking the time to select the model which best serves your requirements. For help selecting a pallet truck for your company, please do not hesitate to contact our technical team on 01384 895859. The hand pallet truck is the basic model of pallet truck available. The advantages of using this within your workforce are that no specific licensing is required to use this model within your workforce, and as the name suggest it is hand operated. Using this model is simple, just slide the prongs under a pallet and utilise the jack to raise the load from the floor. With the hand pallet truck goods can easily be steered to their required destination and lowered with minimal input from the operator. The hand pallet truck is the optimum choice for distribution companies, where the aim is to get an item from one place to another, as quickly and efficiently as possible. However if space is limited within your factory or warehouse, a manual stacker may provide the solution to your handling equipment problem. 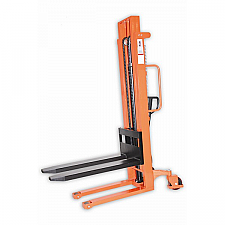 Manual stackers are considered to be a cheaper alternative to the conventional pallet truck, coming into their own in restricted areas such as loading bays. The stacker can be used to lift heavy loads and objects from the ground and load them either onto a storage location or transport vehicle. Similar to the hand pallet truck, the manual stacker is fantastic for new buyers, especially those concerned with safety in the workplace, as no training or qualifications are required for operation. The manual stacker is cheap, efficient and safe. This entry was posted in Handling Equipment and tagged pallet trucks on July 2, 2013 by admin.